Heard of the Pulse Oximeter? In a fast paced world like ours, where medical technology is at its peak, lifestyle-related diseases like hypertension, diabetes etc are quite common amongst people. People don't have to go to hospitals to get their blood sugar, blood pressure or triglyceride levels tested anymore. Advanced, compact and easy to use devices are available at your doorstep so that you can keep a regular record of your health. One such device is a pulse oximeter. A pulse oximeter is a simple, cost effective and a non invasive device that tells you how much oxygen is present in your blood. It measures the oxygen carrying capacity (also called oxygen saturation) of hemoglobin (a component of blood). The colour of blood varies depending on how much oxygen it contains. A sensor in the device is attached to the person's finger, nose, earlobe or forehead which emits two lights of different wavelengths along with a photo detector that detects the colour of the venous blood. 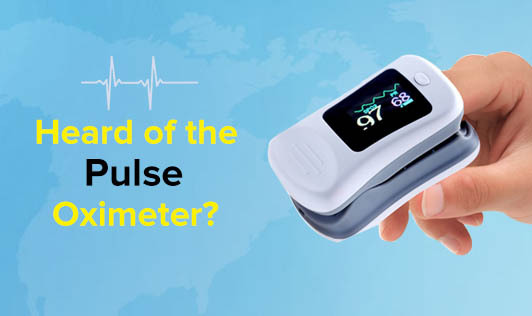 The values of the pulse oximeter depend on your health conditions, respiratory rate, percentage of oxygen in the air, how active you are and other factors. For a normal healthy person, the oxygen saturation level (SpO2) should be around 94% to 99%. For people with mild respiratory problems, SpO2 levels should be above 90%. If levels fall below 90% then the person should be put on a supplementary oxygen source and a doctor's assistance is absolutely essential. A pulse oximeter is a very handy device used in order to regularly monitor a person's tendency to develop a cardiac or a respiratory illness. It is one of the most user-friendly medical tools available.